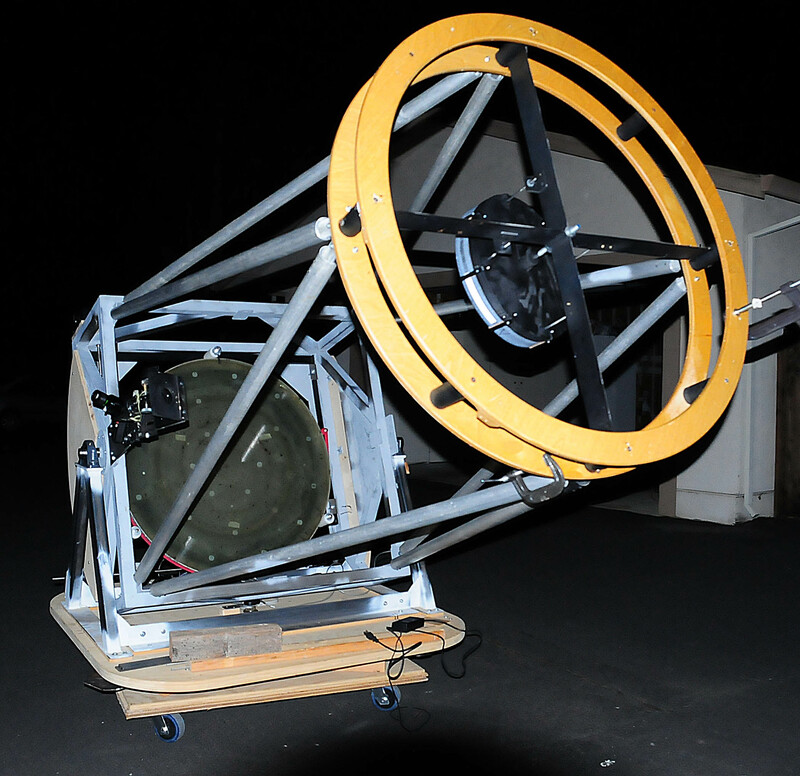 Project 40 | A Robert Ferguson Observatory project to build a 40-inch reflecting telescope. 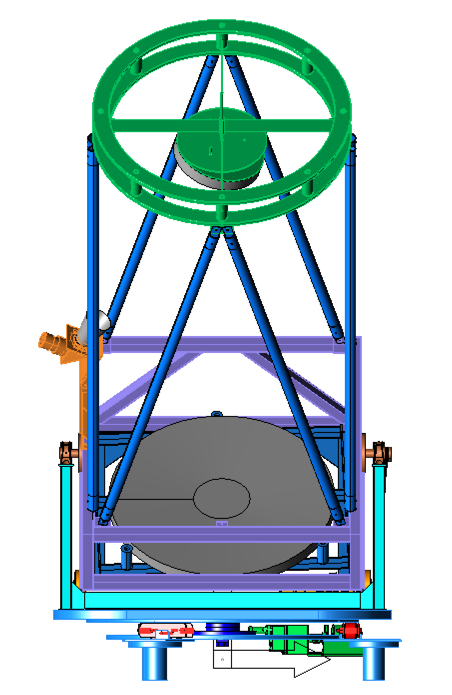 A Robert Ferguson Observatory project to build a 40-inch reflecting telescope. After more than 12 years of effort and many important milestones on the way, we have reached a new milestone on the way to our final destination. The Project 40 telescope is in the west wing of the Robert Ferguson Observatory. 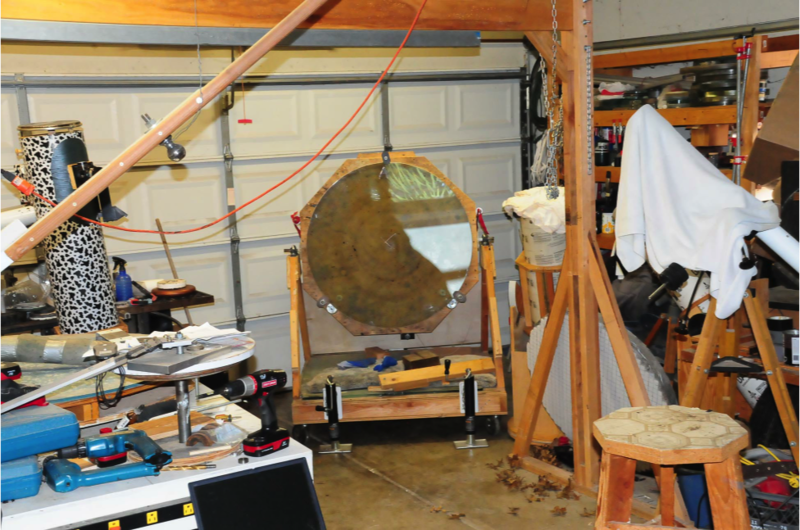 In early December 2015 Bill Russell’s 24-inch reflector was carefully and gently disassembled and stored in preparation for its new owner – is that you? 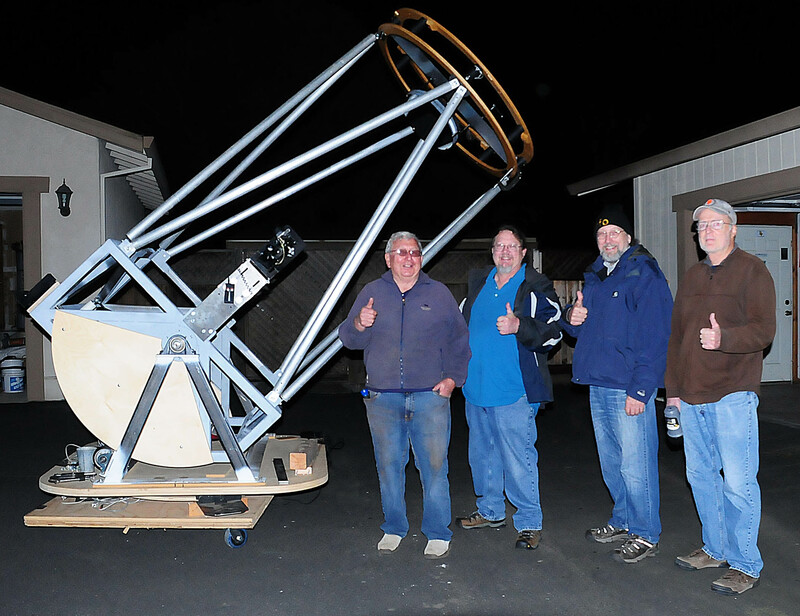 Larry McCune, Mark Hillestad and Steve Follett then began the process of installing the telescope in its new home. As we expected, Larry had to do some on site machine work to mate the telescope mount to the piers, drilling holes in the steel mount plates and into the piers to securely hold the telescope in place. Then the re-assembly of the telescope from its recent disassembly began, installing the three rocker bogey wheel assemblies on the mounting plates with positioning sheet between them that holds the centering shaft. On top of that the team dropped the azimuth ring attached to the thick plywood base also carrying the A-frame supports for the altitude bearings. Then the rocker box was installed in the altitude bearings and the struts and secondary cage were assembled on top of that. The primary mirror cell was slid into position and finally the optical elements were installed – the 40-inch primary mirror, recently coated by Viavi (JDSU/OCLI), the 16-inch tilted flat secondary mirror and, in a later session, the final optical assembly consisting of the diagonal mirror, the Paracorr coma corrector in the integrated focuser, and an eyepiece. At this stage, it was time to balance the telescope and the team was surprised at how little additional counterbalance weight was required to get the telescope balanced at the two critical positions, with the telescope pointing to the horizon and then pointing to the zenith. As we continue to tune the telescope with the final components, the biggest being a finder telescope, we will go back to this step a number of times. The image you see of the telescope propped up on a bench was how it looked at that point. Now the team installed the altitude and azimuth drives. Some final adjustments were made to the components, cutting off a bit of excess altitude drive shaft and providing additional bearing supports on that very long shaft. The azimuth drive likewise went in smoothly once we remembered how all the pieces fit together in that very tight space under the telescope. 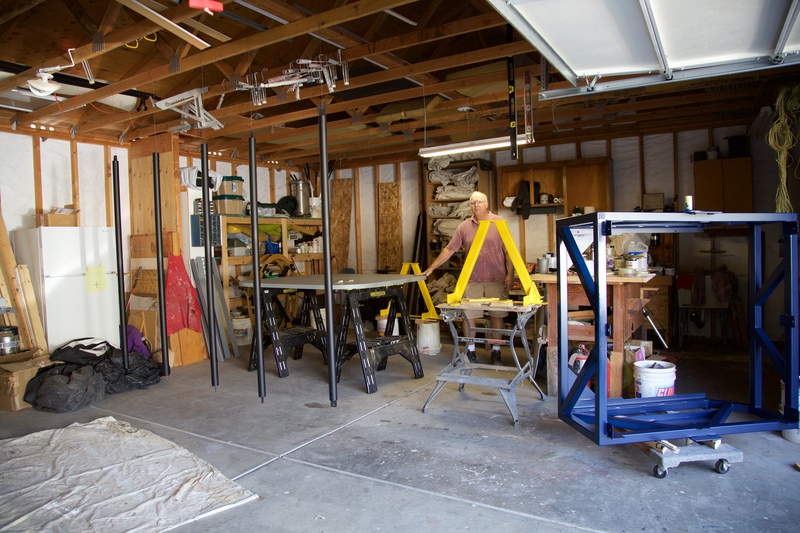 Checks were made for any interference between moving parts, but the work in testing the mount in Mark’s shop and driveway seemed to have paid off. The drive uses servomotors and it measures the rotation of those motors as a way to roughly determine the location of the mount, and then compares that information to digital rotary encoders as a feedback mechanism. All of that is tuned with software supplied by SiTech, the maker of the drive system in a section call Tick Determination. We took the telescope through that process and everything validated for the altitude drive, but the azimuth drive was showing some problems. The symptoms were that we could hear the azimuth servomotor sounding differently as the mount was rotated. We spent a couple of night sessions characterizing the details of the way the mount was acting and diagnosed two issues. First, we measured the height of the azimuth ring as it rotated and found that it varied by a tenth of an inch and found that the variation appears to be caused by the mass of the telescope bearing down on the A-frame base and then on the plywood base. Even though there are force-spreading members bridging the A-frame base, the plywood was being bent down on either side, causing a sort of potato chip shape. And second, we were able to identify some “hills and valleys” as we moved the telescope in rotation by hand, and we think that this is caused by one or more of the bogey wheels (there are six, two in each rocker bogey assembly) being flattened or otherwise dinged, since the “hills and valleys” are separated by a single rotation of one of the bogey wheels. In January, we fixed the potato chip base by adding some more steel to the cross member and inserting a shim to counteract the force that caused the shape change of the base plywood. And we replaced the bogey wheels – they are 6 years old and have, at times, rested for months with the telescope on top of them. We switched to nylon-filled wheels. With both of these fixes in place, the telescope moves much more smoothly in azimuth. We decided that we should test the drive system in tracking mode to see if we could continue with testing, training and opening of the telescope despite the errors in the azimuth drive. Over short distances, the drive seemed to be behaving without issues. So on a night when we finally had clear enough sky to see a star or two, we collimated the optical components. This process lines up the components so that they are pointed exactly along the optical axis through the center of their figures and involves making small adjustments to the mirror holders of the primary and secondary mirrors to aim them more precisely as measured with a standard laser collimation tool. Once collimation was completed and the telescope was aligned with a temporarily mounted Telrad, we pointed the telescope for the first time at two bright stars and synchronized the drive to those two points. With the telescope pointed to one of those stars, we were rewarded with sharp star images that were round inside and outside of focus, the standard star test that validates the correctness of the primary curve and the rest of the optical system. As a bonus, the stars across the field had no visible coma, even though the Paracorr coma corrector had not been fine adjusted. 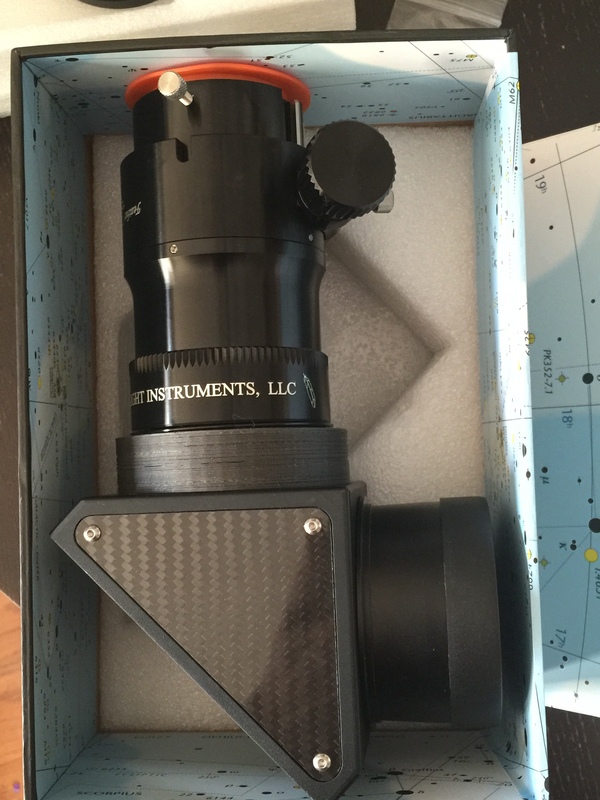 In a fast F/3.6 telescope like this one, you would expect to see coma, star images that look like small comets, at the edges of the field. The coma corrector eliminates those with some carefully designed optics. And finally, we were able to do all of this image evaluation work without once touching the drive controls – the telescope tracked for 20-30 minutes with the star in the center of the field. Now we were ready for the real test. We impatiently waited for M42, the Orion Nebula to rise high enough to see, in what were really crummy skies. Jet contrails were puffing up in the moist sky into straight-as-an-arrow clouds that would drift over Orion and the rest of the sky, slowly obscuring and revealing the sky to us. We finally couldn’t wait anymore and pointed the telescope at the object, even though the observatory wall blocked half of the mirror aperture. We often tell others about our work here by describing the “Wow!” moment that we give to our visitors when they look through a telescope for the first time. I think I can say that Larry, Steve, Mark and I had a genuine “Wow!” moment of our own as we saw the Orion Nebula in a way that none of us had every seen before. The Trapezium was sharp and there were many more stars in that field than I remember ever seeing before. The clouds of the nebula filled the field and we could see color in the field, indicating that there was enough light coming through the eyepiece to trigger the color receptors of our eyes. Using the fine motion controls of the drive we could examine the full extent of the cloud, wandering through that stellar nursery like a walk on a new trail in the park. The process of tuning the telescope, the training, and the documenting the way we will use this instrument to present the sky to our visitors has just begun. This milestone, especially that moment when we saw that the images were all that we had hoped for over the last 12 years, is one that we will remember for a long time. But it is a mere stopping point on the longer trail we are on, to bring the Universe to our visitors, to enrich the experiences of our docents, and to inspire others to try to do what they are not quite sure they can do. Join us in the coming years to look through this new window to the stars. Steve Follett and Mark Hillestad were in the clean room at Viavi Solutions as their team opened the vacuum chamber and all got their first look at the new mirror coating. This beauty (!) was carefully moved out of the chamber and moved to the post-process clean room. Today Mark posted that the mirror is now safely housed in his shop, waiting for its trip to Robert Ferguson Observatory for installation in the telescope mount in the West wing. 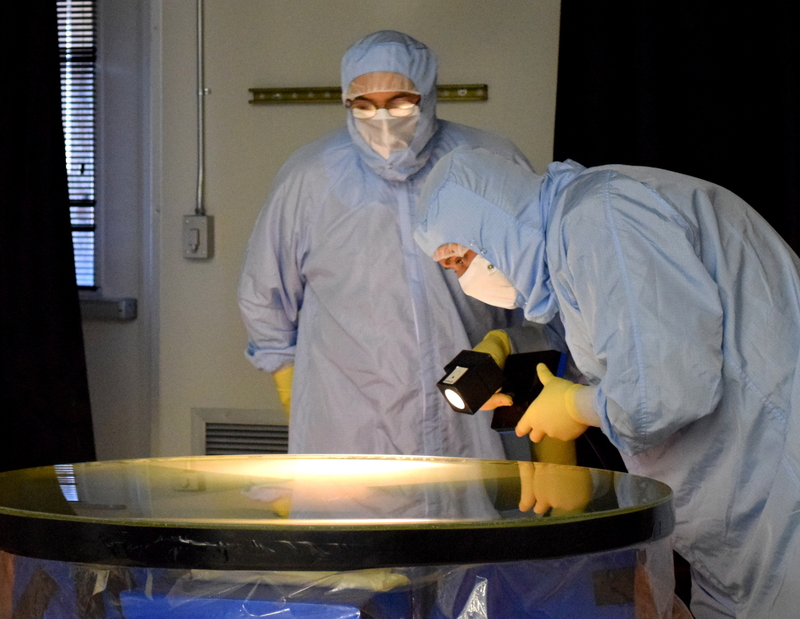 On Tuesday, October 20, 2015 the team at Viavi Solutions (JDSU, Optical Coating Labs) led by Charles Kennemore put a coating of aluminum and their patented anti-reflection coatings on the 40-inch mirror for the VMOA Project 40 telescope, which will be installed at the Robert Ferguson Observatory at Sugarloaf Ridge State Park later this year. Project 40 team members Steve Follett and Mark Hillestad were present during the operation. Viavi Solutions donated the costs of preparing and applying the coating to this mirror which will be used by the public visitors to the Robert Ferguson Observatory as a community service. The new telescope will open to the public in early 2016. 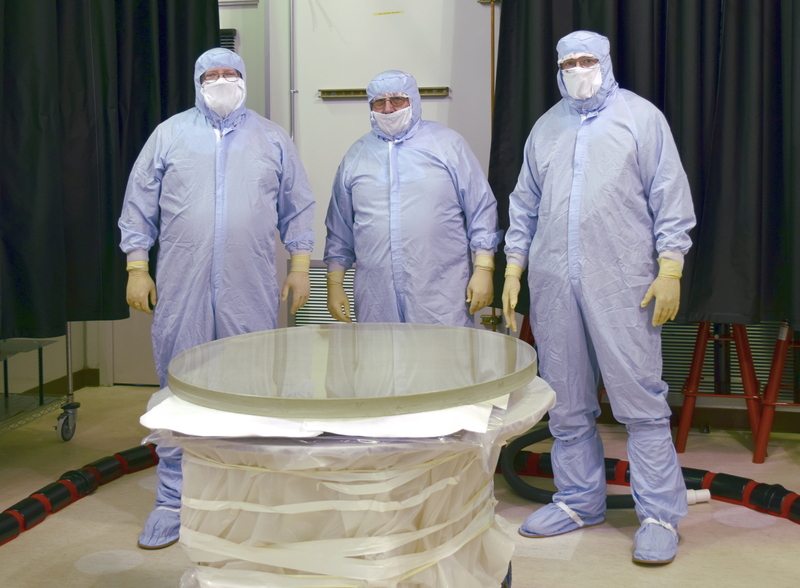 Larry, Steve and Mark in clean room garb with the mirror in place for cleaning. Charles Kennemore’s experts cleaning the mirror as Steve looks on. 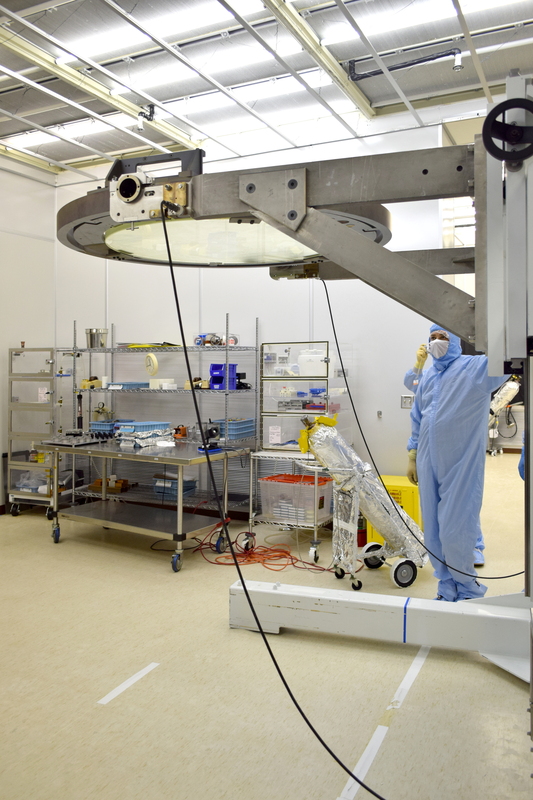 Today the process of coating the 40-inch mirror began at JDSU began with a thorough cleaning. You recognize these three bunny suited glass guardians, right? In case you don’t, that is Steve on the left, Larry in the middle and Mark on the right. The mirror was placed in this space for the thorough cleaning and drying that is necessary to get a perfect aluminum coating to adhere. The expert team from JDSU invited the RFO mirror making team to not only witness but participate in the process as they take it through the painstaking steps needed to produce the results for which they are renowned. Let’s hope he doesn’t find what he’s looking for! Once the cleaning was done and the surface dried, the inspection for any defects proceeded. 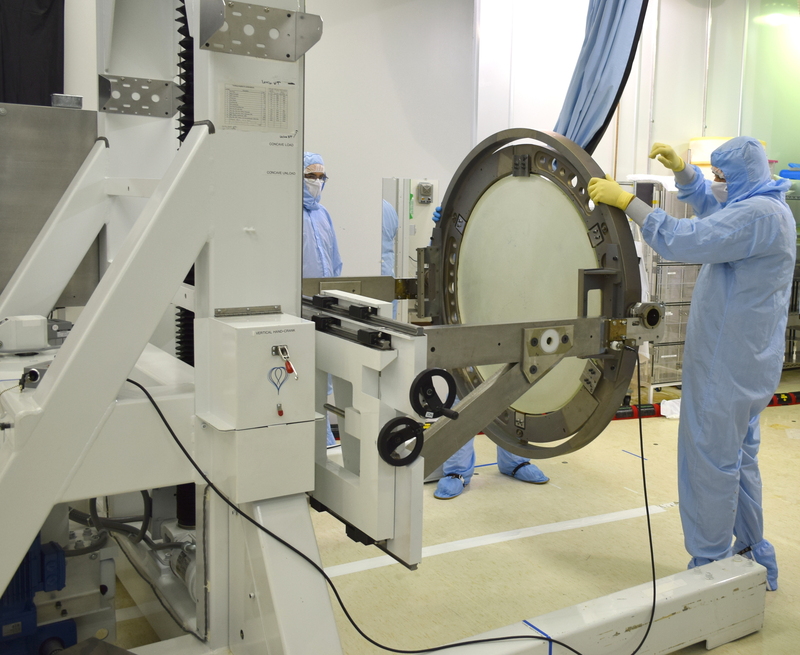 Satisfied, the mirror was placed back into its carrier and moved so carefully and slowly to the coating chamber where it will wait until tomorrow morning. We’ve stopped breathing now. 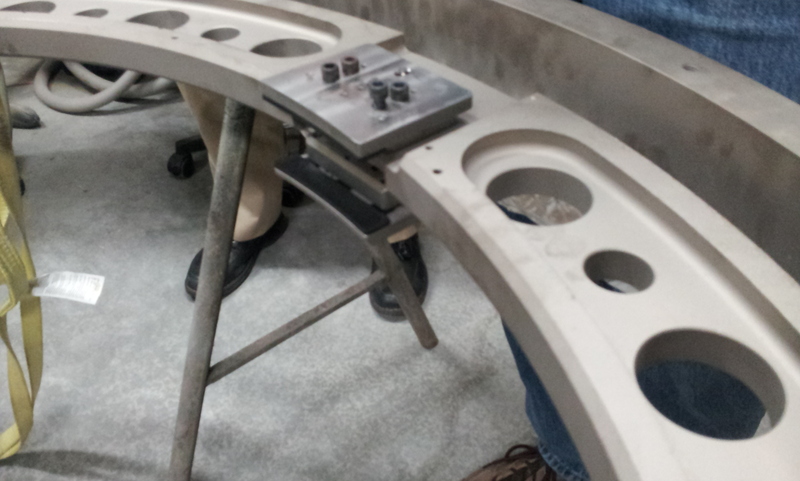 The mirror is held in a ring with top and bottom stays so that it can be flipped for the coating position. Precious cargo on the move! Safely tucked into the vacuum chamber where it will become something remarkable tomorrow. The 40 inch mirror is scheduled to be cleaned on Monday by the team at JDSU led by Charles Kennemore. Did I mention that the company, which has taken the new name Viavi Solutions, is donating the coating for the mirror? I can’t repeat it enough! Assuming that we don’t find anything during the cleaning, we are tentatively scheduled for the coating chamber on Tuesday, October 20. Standby for images from both sessions in the next few days. Meanwhile, Mark Hillestad has been busy in the shop putting some color onto the telescope framework. The A-frame, rocker box, base plate and struts all have their first coat of paint. The secondary cage, which is a nice piece of finished wood that was originally built by Jeff Baldwin, will be left with that finish. The next time these parts are re-assembled, they will be housed in the West wing of Robert Ferguson Observatory. You should be able to see each of the struts, A-frame, box and base in the image, as well as the painter responsible for their new personality. 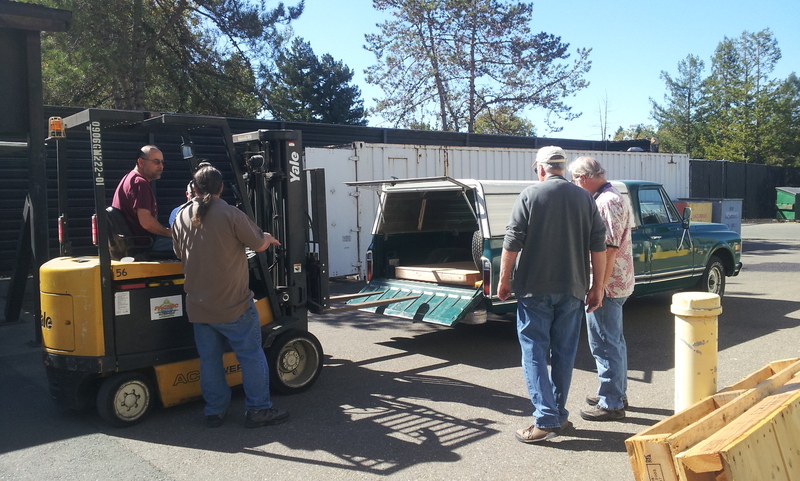 The 40 inch primary mirror for the new telescope was delivered to JDSU in Santa Rosa today. You can see in the photo that the team learned that all this time we should have had a forklift to move the mirror around – doh!! The JDSU team moved it safely into the house and we are now waiting for a call from them to let us know when it will be coated. 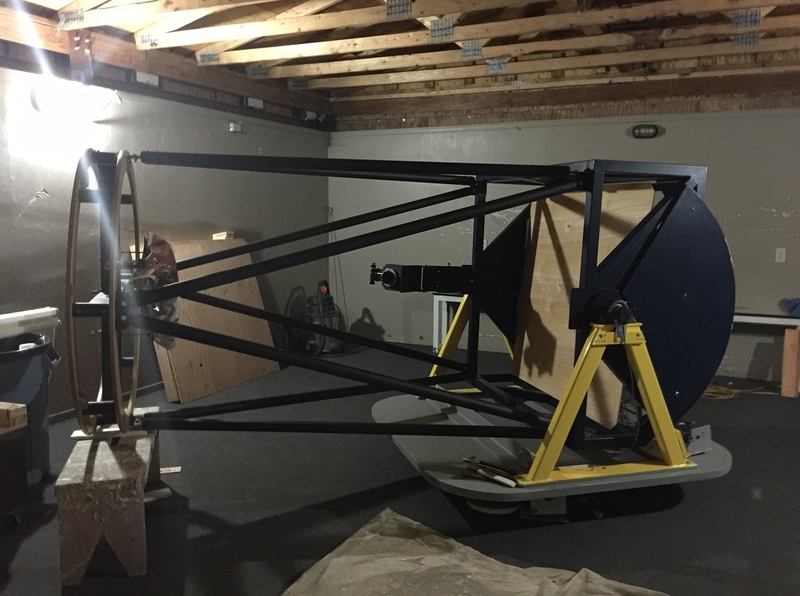 I can’t express how EXCITED we are and grateful to JDSU for donating their premier work for this telescope which will be used to bring the night sky to our community for many years to come! Charles Kennemore of JDSU in Santa Rosa, a Senior Engineer from the Optical Coating Labs part of JDSU, now Viavi, invited us on a tour of the operation with his team of engineers who will coat the 40-inch mirror. Members of his team have visited Steve Follett’s garage shop to see the mirror and got our “tour” of the mirror grinding, testing and interferometer setup. Project 40 team and the Viavi Engineering team. Steve, Mark, Larry and I came to the JDSU offices in Santa Rosa on a sunny Friday afternoon to show us what preparations his team had made and what we could expect from them in the coating process. One comparison of the two tours is that there was MUCH more walking involved with the OCLI tour. Charles and his engineering team hosted us for lunch and showed us a video of a precision domed window coating process. We saw all of the handling equipment and all of the processes that would be used to take our mirror from crate to cleaning to coating to testing and back to the crate. Charles made it clear from the start that our mirror was as important to them as the multi-million dollar projects that they work on every day. Our first stop on the tour was the receiving shop where the mounting ring was prepped and final adjustments were being made for accepting the mirror. 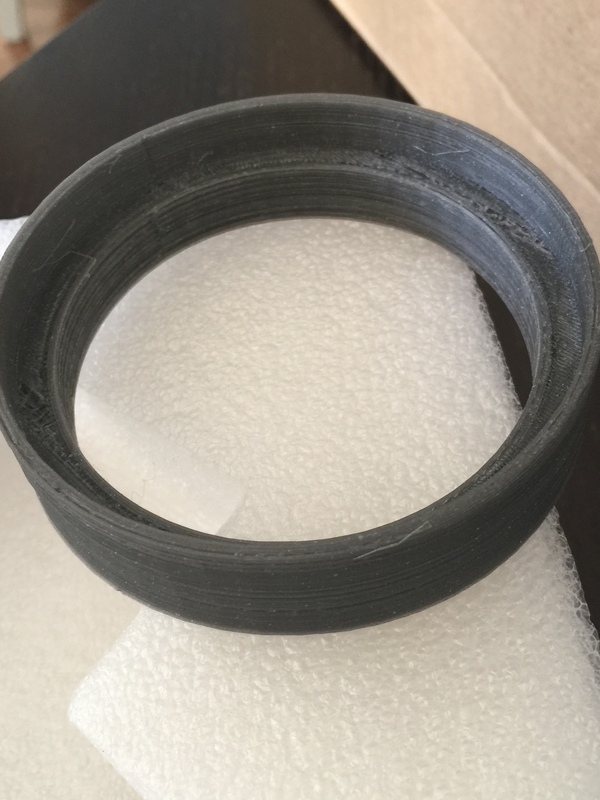 The mirror support ring is over one meter across. 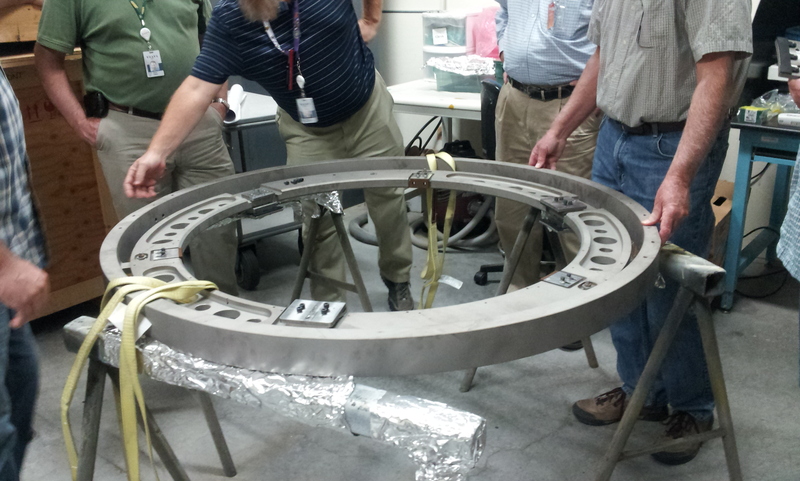 The 40-inch mirror will sit inside the inner ring. 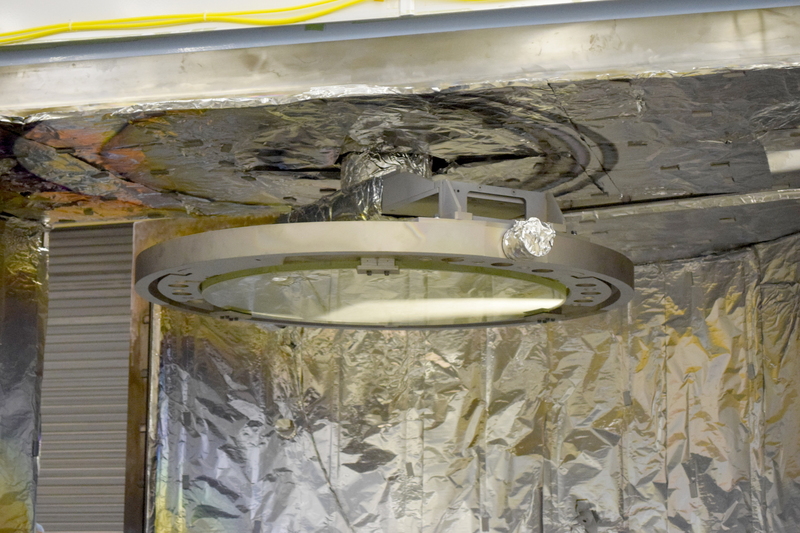 The mounting fixture is a steel ring more than a meter across with many attachment points. When the mirror is uncrated, this ring will be slipped over the mirror’s circumference, supports will be secured under the mirror, the ring will be lifted to support the mirror, and then supports will be secured on top of the mirror’s edge, with rubber cushions between the steel supports and the mirror, top and bottom. Three of these mirror clamps hold the mirror, top and bottom. The ring has interface attachment points for the electric moving cart to grab and two large knobs outside the ring that will let the robot flip the mirror. That is necessary because the mirror will be face up for cleaning and face down for coating. Even though OCLI at JDSU is a much smaller company than it was 20 years ago, the laboratories, offices and shops are labyrinthine and feel huge to those of us used to working our home shops. On the way to the main event of the tour, the chamber where the mirror will be coated, we saw smaller machine-controlled coating chambers, coating chambers that use lithography to precisely coat miniature optics integrated on a chip and mirror grinding shops that looked very familiar – a pitch pot is still a pitch pot even in a sophisticated enterprise like OCLI. And they use the same 9 micron polishing material that we do – they just buy it in 20 pound boxes! The 40-inch mirror will be coated in this 120-inch chamber and manually controlled throughout the process by one of the engineers we met. We will be invited to watch the whole process which will likely take a full day to get through the cleaning, coating and testing. This is the 120 inch coating chamber in the heart of JDSU. In this image of the coating machine you can see the rotation mounts at the top. 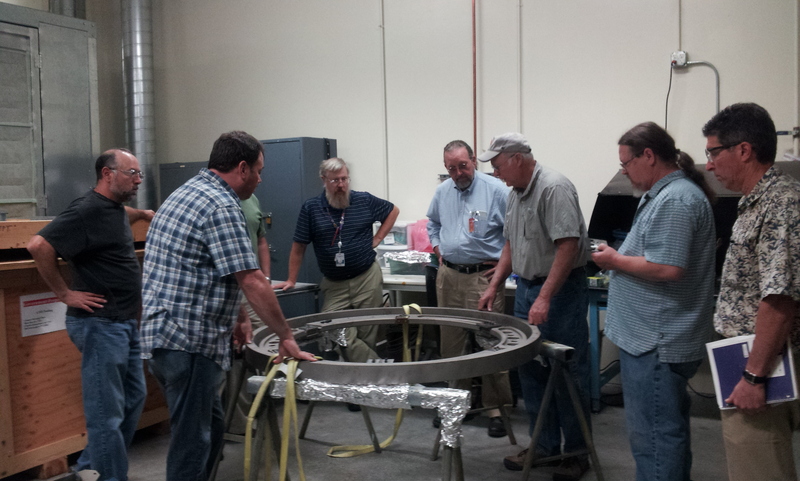 The mirror in its ring will be suspended, face down, and will be slowly rotated during the coating run. Five planetary rotating mounts around the central one will hold “witness” glass that will be coated along with the mirror that can be used to evaluate the goodness of the coating without disturbing the mirror itself. 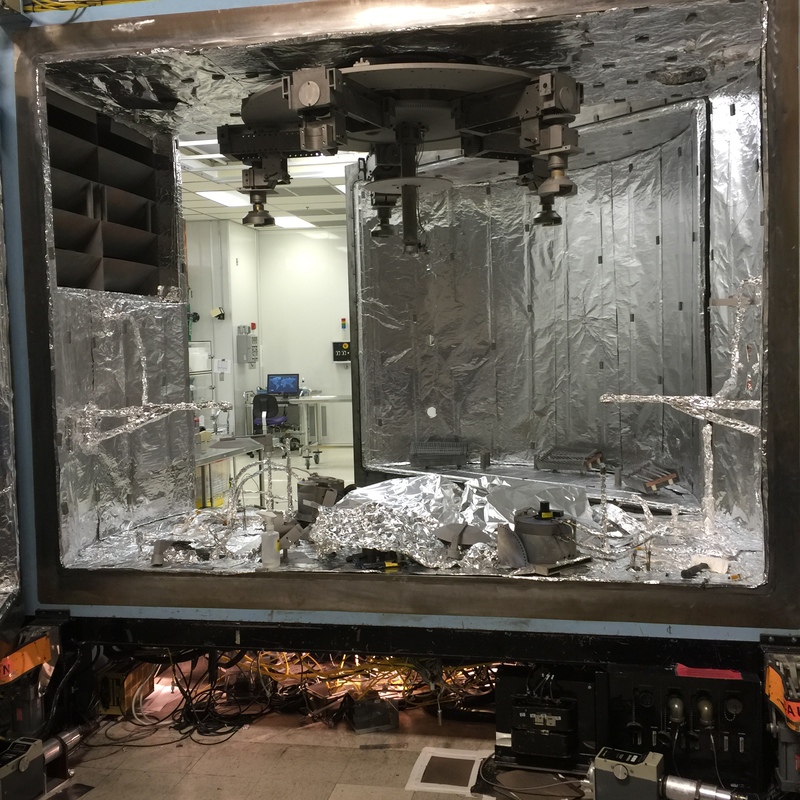 The bottom of the chamber contains the pots of aluminum and other substances that are heated to melting point and vaporize within the evacuated chamber. Outside this chamber were the huge pumps used to pump the atmosphere out of the chamber once it is locked down, and oil diffusion pumps which pump the last molecules our of the chamber in preparation for the coating. The whole process is controlled by an operator and monitored in a number of ways, including a sensor which weighs the mirror and is sensitive enough to see the increased mass as the coating is deposited on the mirror surface in a very thin layer. The chamber room itself is surrounded by rooms dedicated to preparation of the mirror before and post-coating processing. Finally, as we made our way out of the heart of the shops, we got to see the optical testing lab where a 24-inch zygo interferometer was kept under wraps for testing large optics, especially flats (it has a 24-inch flat incorporated into its optics!) along with optical benches that would be very familiar to any amateur telescope maker for setting up and doing Foucault test of a mirror. Charles was especially keen to show us one more testing lab with electron microscopes and a large atomic force microscope where we ran into a very tall Phillip Hebenstreit, who turned out to be his father, Willy! Here, Charles and Willy are able to troubleshoot problems in coatings by actually imaging them at nanometer scales to find the causes of unwanted bumps and wiggles in a coating (was the mirror clean? was there a disturbance during the coating process?). Demonstration images of the process of investigating mysteries in a process at this scale were fascinating to hear about and to see. Back in the conference room where we started, Charles explained why we had been delayed for so long and then asked us how soon he could have the mirror. We all looked at each other and, pretty much as one, said we could get it there in its crate in the next couple of hours, if he liked! He said he was going to try and insert our project into the chamber schedule in between a couple of delayed projects and that he would let us know in the next week when to bring it in. We said we could manage that with no problem. Until about a year ago this team was building a telescope with something like a Nasmyth design. James Nasymth invented the idea of using three mirrors in a telescope to eventually direct the optical path perpendicular to the telescope tube through a primary axis of rotation for the mount. The result is that as the telescope rotates about that axis, the eyepiece does not move, nor does any kind of instrument that might be installed there. Professionals use this kind of design on their telescopes to avoid mechanical problems caused by very large and massive instruments at the prime focus. Our interest was to get the eyepiece down to the height of a standing or sitting person, eliminating the need for a ladder in the public observatory at Robert Ferguson Observatory. Wikipedia version of the Nasmyth design in schematic form. We weren’t quite Nasymth, but the concept was the same. The primary (40-inch) mirror is a concave paraboloid shape. It reflects the incoming light from the sky to a secondary on that same optical axis that is a convex hyperboloid. The light, still on the same axis, then encounters a third mirror, this time a flat, tilted at 45 degrees to the optical axis, bouncing the light through the side of the tube. 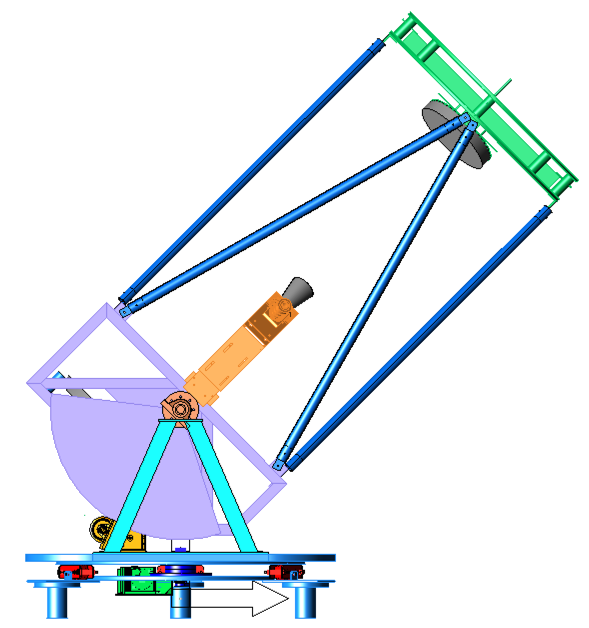 That’s where we deviated from the original Nasmyth design – we allowed the final optical axis to be closer to the front of the telescope (optically), meaning it would not be at the mechanical altitude axis of rotation, but rather a few inches above that. The result was an eyepiece height for visual users that wasn’t stationary, but was still reachable for most individuals without a ladder. During the first star tests we did of the optical components of the telescope, we incorporated the Nasmyth convex hyperboloid secondary mirror. 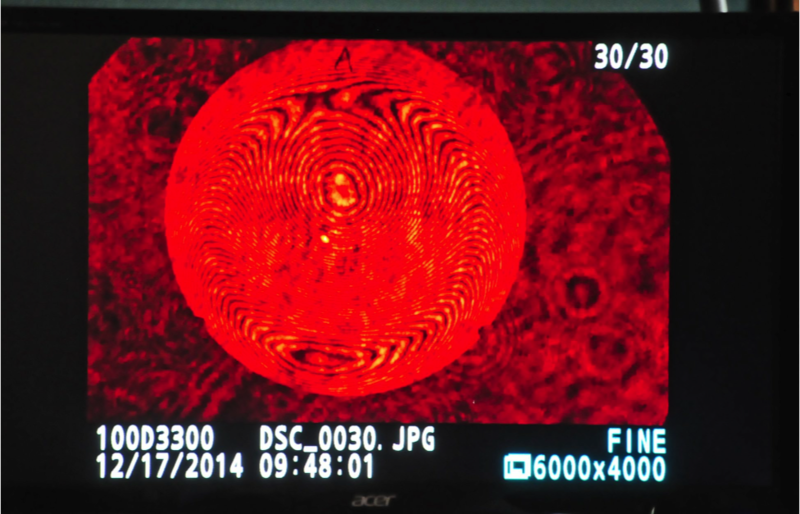 Those first tests showed we had some significant astigmatism in the system. We removed the secondary from the system and placed a video system at prime focus where we validated that the primary mirror was the source of most if not all of the astigmatism. Other blog entries since that time 18 months ago tell the story of learning how to make and use a Bath interferometer to better test the primary mirror in the shop and our eventual arrival at an acceptable figure as evaluated by both interferometry and star tests. While that process was unfolding, we were thinking about our challenges with the secondary mirror. Testing the surface of the secondary mirror was not something we were entirely confident we could do. Our experience with the primary, where we tested to the best of our ability with a multi-zone Foucault shadow test, made us less confident of our tests of the secondary curve. We also learned something first-hand about the behavior of the Nasymth-Cassegrain optical design in practice – the placement of the secondary along the optical axis is very critical and requires fine adjustment to bring the focal plane into a desired location. When we first tried locating that focal plane, we found that we had incorrectly estimated that location by several feet (!) but that by adjusting the location of the secondary less than 2 inches, we corrected that location. While we could successfully get a focal plane where we wanted it, our telescope will be operated by a large team of docents who would be asked to make these kinds of fine adjustments if the primary mirror was every collimated, and the touchiness of the secondary location worried us in that situation. We had considered a folded Newtonian design early in the project and had discarded it as impractical for a mirror the size of ours. The basics of a folded Newtonian include the same paraboloid primary mirror reflecting the optical path to a flat secondary mirror (the fold). The secondary reflects the optical path back down the main optical axis to a diagonal mirror on that axis, where it bounces out to the focal plane beyond the circumference of the optical tube assembly (OTA). We had planned that the primary be a short focal ratio and the mirror, with astigmatism, was at about f/3.6 (the ratio of the focal length to the diameter of the mirror). In order to bring the focal plane near to where we wished it in the mechanical design, the secondary flat mirror would be, well, huge. The other problem that a folded Newtonian design had to solve was coma. In a reflecting telescope with a paraboloid primary mirror, when you are observing the image of a star at the center of the field, on axis, you get a nice, compact, point-like image. But when you look at the edge of the field at stars that are off-axis, forming a small angle with the pointing direction of the optical system, you get images that look like comets, all pointing toward the center of the field. This is true for all Newtonians, folded or otherwise. Small amateur-built telescopes don’t visibly suffer from this aberration of the image because the effect is small above focal ratios of f/8 or so. Coma gets increasingly difficult to ignore as you reach for smaller focal ratios. It turned out that by the time we were having these deliberations, Mel Bartels, for whom an asteroid is named and who authored the earliest versions of the software we are using on Project 40 drive systems, had been experimenting with short focal ratio reflectors, like an f/2.8 6-inch design documented at http://www.bbastrodesigns.com/6inchF2.8/6%20Inch%20F2.8%20Telescope.html. Further, he had inspired others to similar experiments and there were now dozens of examples documented at amateur web sites demonstrating the challenges and rewards of this design. In particular, many of these designers had adopted a coma corrector from Paracorr that solved the coma problem by inserting a lens assembly in front of the eyepiece, eliminating the coma aberration with specific eyepieces. 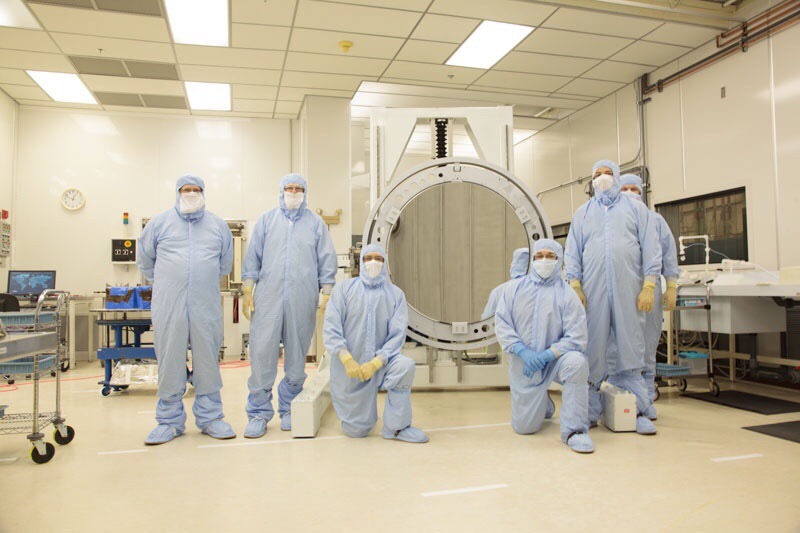 With a potential solution for the coma problem of a short focal ratio Newtonian, the team evaluated the options for reducing the size of the secondary mirror. We are working with a focal length of 144 inches. When the telescope is pointing straight up at the zenith, the eyepiece will be at its greatest height above the floor. The mount places the primary surface about 23 inches above the floor and we would like the eyepiece to be no higher than 60 inches above the floor. The primary-secondary distance (x) plus the secondary-diagonal distance (y) plus the radius of the OTA plus a couple of inches to get the focal plane out to a usable location (z) gives us a formula for the height of the eyepiece above the floor: h = 23 + (x – y) and a constraint on those values: x + y + z = 144. Since z isn’t going to change for our design, consider it a constant of 24 inches and with a target of 60 inches for h, we can solve the two equations to reach x = 78.5 inches. The diameter of the on axis light cone at a distance x from the primary mirror is D’ = D (1 – x/F), where D’ is the diameter of the light cone at x, D is the diameter of the primary mirror, and F is the focal length of the primary. At the design distance of 78.5 inches, the secondary would need to be 18.2 inches in diameter and the diagonal would need to have a minor axis of 6.7 inches. Side View of the Project40 Design with tilted secondary mirror. To reduce both of those diameters the team explored a design that tilted the secondary mirror to move the prime focus outside of the OTA without reflecting off of a diagonal mirror. Eventually the diagonal mirror was restored, but as a standard eyepiece diagonal (not one mounted on a spider). With this design, we reduce z to the back focus or distance from the final bounce off of the diagonal mirror to the prime focus, about 6 inches when using the Paracorr. And y is also reduced because the optical path is traversing a diagonal line from the center of the secondary to the edge of the OTA. With some optimization, we settled on a 30 degree bounce off of the secondary (by tilting the secondary by 15 degrees) and that gives a y’ corresponding to the altitude of that triangle of y’ = y cos 30. When you do the rest of the math, the secondary distance from the primary is 83.9 inches where a 16.7 inch diameter secondary will capture all of the light from the primary. We were able to refine that design by allowing the zenith height to creep above 60 inches because we would rarely point that high in the sky and by sacrificing a half inch around the circumference of the primary mirror where a turned edge was only going to give us some scattered light in any case. The result was a secondary 16 inches in diameter, which is 30% less area covered than the 18.2 inch diameter secondary we started with. Front view of the Project40 design with tilted secondary mirror. The final problem we had to solve was a mental one – it was hard to allow ourselves to accept a 16 inch diameter secondary mirror, so much bigger than even the 6-inch diagonal we had purchased for the Nasmyth design. So we recalculated and recalculated and asked each other questions (like, how are we going to make a 16 inch flat mirror!) over and over again until last June. By that time, we were seeing enough progress in the interferometry of the primary mirror that it was time to make a decision. And because we didn’t believe that we could make the flat ourselves, we checked the budget, suspended our belief that secondary mirrors are not that big, put the secondary mirror out to bid, and chose Custom Scientific to make the mirror for us. The order was placed in July and they delivered it in September, a month ahead of schedule. In the meantime, we were exploring the Paracorr coma corrector on the Televue web site. The design as it comes from the maker includes a rotating tube at the eyepiece end that has lettered locations on a helical track that give you the ability to precisely control the distance from the ocular to the exit lens of the corrector. Each eyepiece would have its own letter setting for optimal performance of the corrector. This was workable for the docent team that would be operating the telescope, but would definitely require some training. Then we found a reference to the SIPS – an integration of a Starlight Instruments feather-touch focuser with a Type 2 Paracorr corrector. A review by one of the early purchasers locked us in on this solution. In operation, he reported that he could use any eyepiece with the corrector, rough focus with the main focus adjustment to get the image of a star in the center of the field looking point-like, and then use the feather-touch fine focus adjustment to make the stars at the edge of the field point-like. This is so much like normal focusing with the small addition of paying attention to the center and then to the edge images that we settled on this solution for the telescope. With the focuser now on the corrector, our previous thinking about the human end of the telescope, with a classic focuser (rack and pinion or Crayford) aimed at the secondary, became a design with a standard diagonal mirror mounted to point at the secondary, reflecting the light up to the corrector-focuser-eyepiece assembly for easy use by the observer. While we calculated that with a back focus of only 6 inches to the prime focus the diagonal mirror could have a 2 inch minor axis, we decided to give ourselves a little more room for error and chose a 3 inch diagonal mirror. Finding one became an interesting problem, but our friends at Orion located one for us. 3D printed prototype of the SIPS-Diagonal adapter in plastic. Adapter assembled to integrate SIPS (above) and Diagonal (below. With the SIPS and the 3 inch diagonal in hand, we had to find a way to integrate those. Since the location of the input of the Paracorr with respect to the primary mirror does not change once set, we realized that we could hard-integrate it to the diagonal. There is a small amount of adjustment that can be had from the SIPS as its input end also allows rotation on a large thread that moves the lens assembly in and out of the mounting tube about half an inch. The SIPS/Paracorr body has a small lip that is 70mm in diameter and the 3 inch diagonal body has a similar lip with a diameter of 80mm, so we designed a cylinder 90mm in outside diameter with inside diameters of 70 and 80mm at each end and only 20mm high. The design carries hex allen set screws to lock each of the diagonal and SIPS to the adapter, integrating them as a unit. We farmed out the fabrication to emachineshop.com, and, in the meantime, did a 3D print in plastic to validate the design. You can see that this design change has been a journey, as has the whole project, filled with small, incremental insights that each solved problems that were revealed as we committed to earlier insights. More than once we have been required to make leaps over obstacles that seemed too much for our skills or patience. 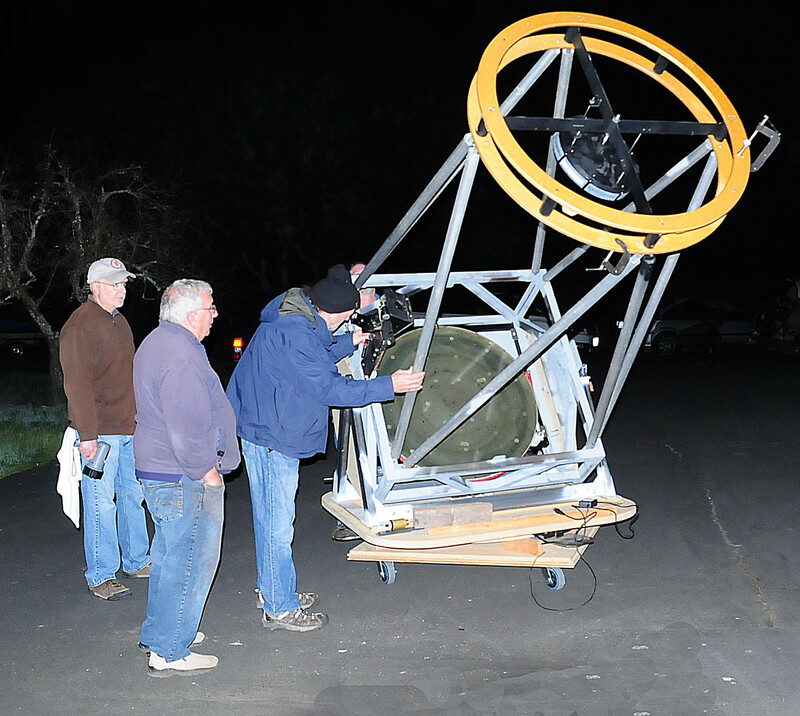 The motivation to persevere through the set backs and to tackle the problems with a fresh mind set from time to time was the desire to bring this telescope to our docents and our visitors at Robert Ferguson Observatory. We know what that community deserves, and we have been determined to bring it. Star Test Update – We Have a Mirror, VMOA! On February 20, 2015, Steve Follett, Mark Hillestad, Larry McCune and I met at Mark’s workshop to do the first star test of the uncoated mirror in 18 months. In previous working sessions the team finished re-assembling the telescope and got the mirror re-installed. A temporary 2-inch diagonal and eyepiece arrangement was placed at near the final location to evaluate star images. That evening, Len Nelson served as photographer and snapped some photos of the team and the telescope after we declared that the star test indicated that the figure of the mirror was refined enough to get it coated. The testing we did was a combination of the classic star tests and some good old fashioned observations. Inside and outside of focus, the images of a bright star no longer showed the box or triangular shapes that characterized our star tests 18 months ago. That, in itself, was a confirmation that the interferometry we have been doing continuously was to be trusted. Easy-to-find Jupiter was the next target and even with the uncoated primary mirror we were seeing pin point images of Jupiter’s moons and bands on the planet’s surface. The final observing test before the fog rolled in that night was a double star, Algeiba, in Leo, with a separation of 10 arcseconds. All agreed that with the 40mm eyepiece at prime focus ( a magnification of 90x) the double was cleanly split in tight images. That was enough for the four of us to make the judgement call that the figure was sufficiently well-corrected to justify coating it. Since that time the team has conducted star tests several times to confirm the results. Even more exciting, when we contacted Fred Van Milligen, VP of Research and Development at JDSU, we learned that despite the long delays he was still interested in exploring whether JDSU could coat the mirror for us and the team has begun a series of meetings with JDSU engineers to plan for a possible May or June date in the JDSU coating chamber. Since you blinked, it is now February 1, 2015, just 18 months after the last post in this highly volatile blog – isn’t time travel a kick? Last post I promised that I would talk about the switch from a Cassegrain optical design to a folded Newtonian design, but its only fair to catch you up since our last post. You’ll recall from August 2013 that we were trying to adjust the shape of the mirror so that we got a flat surface from the analysis of the Open Fringe program. We had lots of good sized bumps. Steve Follett, pictured here in a series of photographs by Len Nelson, along with Mark Hillestand and Larry McCune, have been working on those local irregularities these last 18 months with multiple weekly sessions that consist of measuring the surface after it has been left alone for at least a day, and then doing the briefest work – a few minutes – in reaction to the results of those measurements. 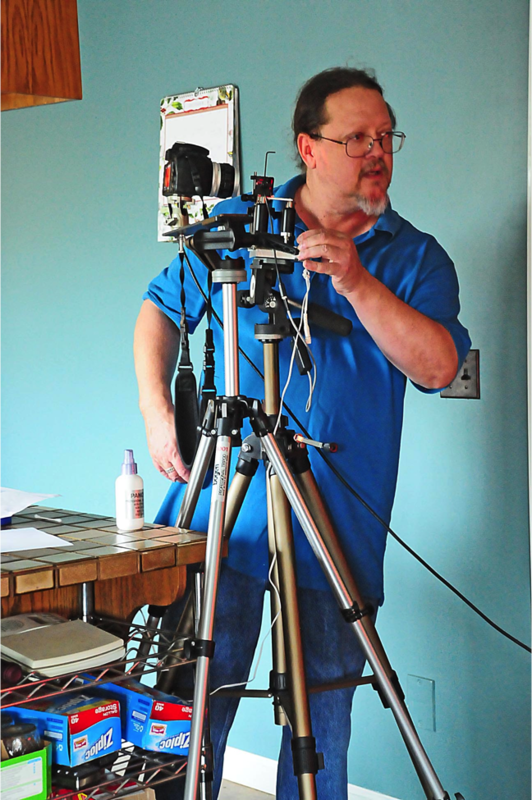 You can see Steve here adjusting the interferometer with a DSLR ready to capture the interferogram as well as an image of the 40-inch mirror in its test stand. 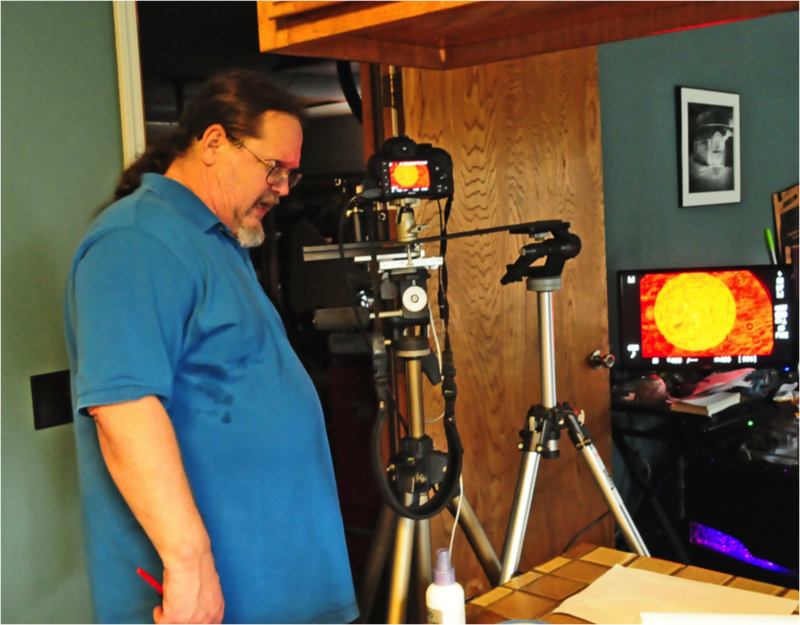 This process was enhanced about a year ago when Larry came into possession of a digital projector that was being made surplus by the local astronomy club (Sonoma County Astronomical Society). The team began to use the projector to throw images of the processed interferograms directly onto the surface of the mirror so that the area of next action would be very clear – no errors in transferring from the report to the mirror. We should say here that this approach is the opposite of what the ATM lists have recommended. We heard multiple times that with the astigmatism or the kind of aberrations our interferograms indicated, we should return to a sphere (back to grinding!) and try again. The contention is that it will take too long to reach an acceptable result and we won’t get the quality surface that we should be trying for. Our team decided that we should continue to make local corrections and slowly but surely sneak up on the correct figure. We are hoping that is what we have accomplished. These three images need some explanation. The first is a sample inteferogram, the basis of the analysis that we do to measure the deviation of the surface from the ideal, a parabola. In practice, many of these inteferograms are captured at different rotation orientations of the primary mirror in its test stand, and then are combined in the Open Fringe software. 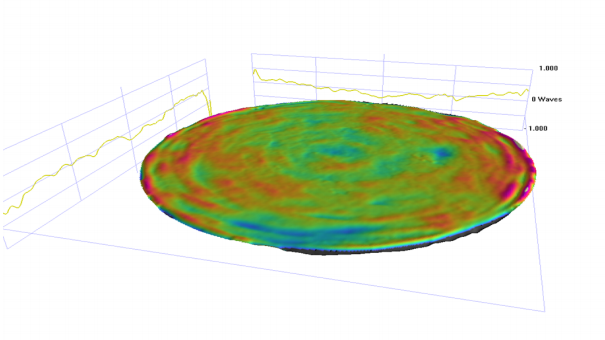 The second image is a 3-D representation of the surface of the mirror once these interferograms have been analyzed, taking into account the minute deviations caused by the mirror flexing on the test stand. You can see that the surface, which should be flat in this image if it perfectly matches a parabola, deviates from that ideal by about a half wavelength of light in the worst case. The third image shows the profile of the mirror taken in cross-section at different orientations rotated around the mirror’s center. 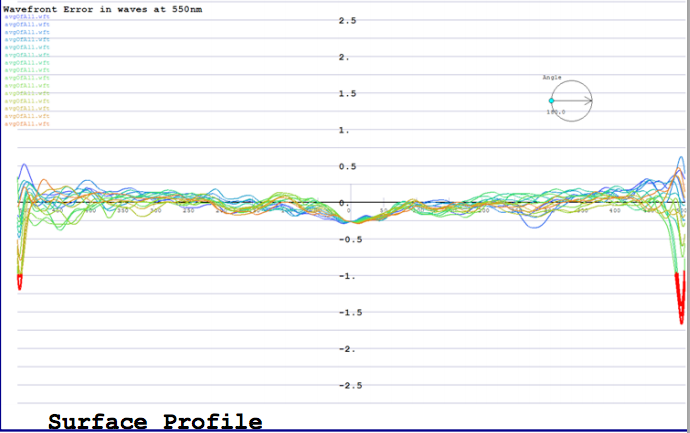 Each line is a cross-section, so we get to see all of the deviations in one view. This graphic confirms the visual conclusion from the one above it that the flattening work of the last 18 months has been making good progress. Enough progress to encourage the team to do a star test with the mirror back in the telescope. What might that star test look like? Here is a simulated star test from the Open Fringe software. If this image is anything like what we see when we do the star test at prime focus, with the new secondary in place, then we will call ourselves complete with the mirror and go on to get it coated. This post has gone on long enough, so I will move on in the next post to the topic I promised back in August 2013 – what it means for us to change our optical design to a folded Newtonian.